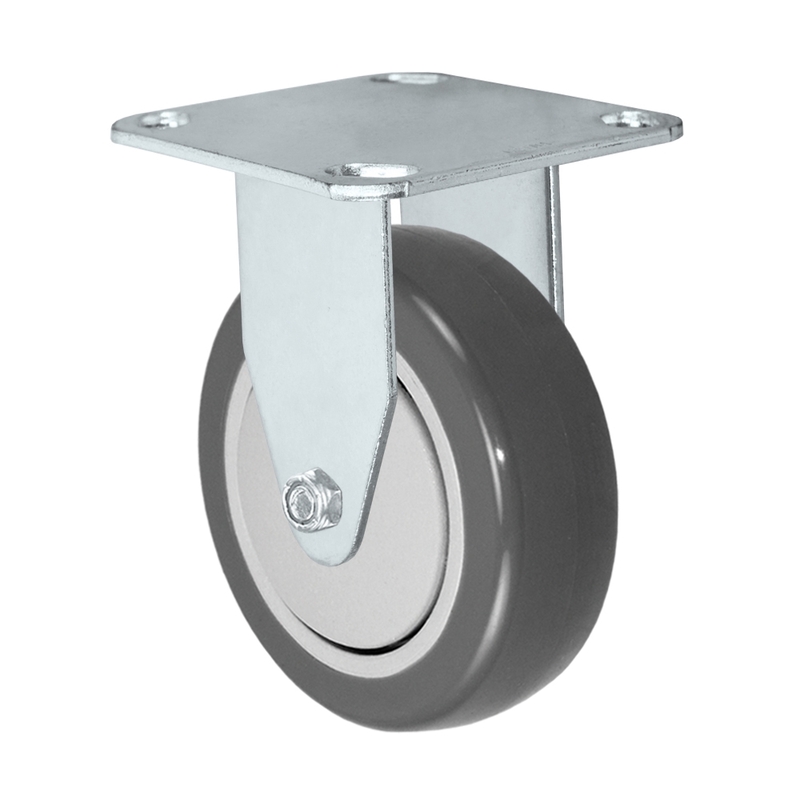 3" x 1-1/4" Rigid Caster | Gray Polyurethane on Polyolefin Core Wheel | 250 lbs Capacity | Plate Size: 3-1/8" x 4-1/8"
The HD-24 Series is a versatile and economic caster. This caster series is perfect for material handling, maintenance carts, bakeries, food service, stocking carts, dollies, and more! Combined with our Thermo Plastic Rubber wheel that has a soft 65 Shore A Durometer non marking high grade thermo plastic elastomer wheel mechanically bonded to a industrial polyolefin core. Thermo Plastic Rubber wheels are resistant to many solvents, oils, greases, water, even blood. Non Marking wheel, quiet and smooth operation. Great for factory floors, institutional, and food service environments. Thermo Plastic Elastomer Rubbe wheels roll easily over obstacles and debris, cords, gaps, and more. The material actually absorbs shocks and vibrations for a very smooth ride. 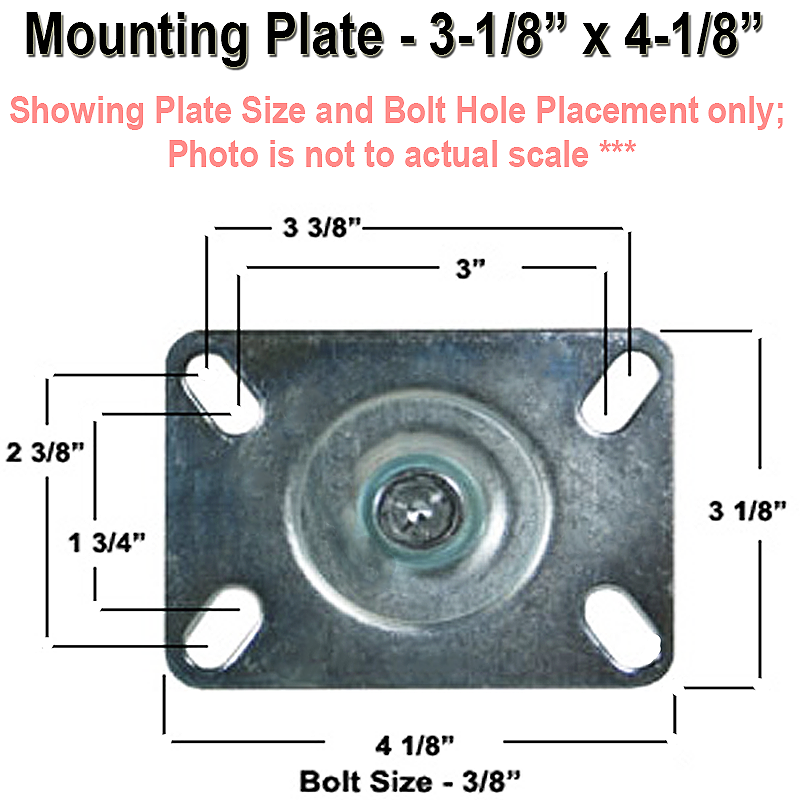 Axle - 3/8" diameter bolt with lock nut. 3" x 1-1/4" Rigid Caster | Red Polyurethane on Polyolefin Core Wheel | 250 lbs Capacity | Plate Size: 3-1/8" x 4-1/8" 3" x 1-1/4" Swivel Caster | Gray Polyurethane on Polyolefin Core Wheel | 250 lbs Capacity | Plate Size: 3-1/8" x 4-1/8" 5" x 1-1/4" Hi-Temp Glass Filled Nylon Wheel | Swivel Caster | Capacity: 350 lbs | Plate Size: 3-1/8" x 4-1/8" 3" x 1-1/4" Swivel Caster | Red Polyurethane on Polyolefin Core Wheel | 250 lbs Capacity | Plate Size: 3-1/8" x 4-1/8"
3" x 1-1/4" Swivel Caster | Thermo Plastic Rubber Wheel | 225 lbs Capacity | Plate Size: 3-1/8" x 4-1/8" 5" x 1-1/4" Swivel Caster | Gray Polyurethane on Polyolefin Core Wheel | 325 lbs Capacity | Plate Size: 3-1/8" x 4-1/8" 3-1/2" x 1-1/4" Rigid Caster | Blue Polyurethane on Polyolefin Core Wheel | 275 lbs Capacity | Plate Size: 3-1/8" x 4-1/8" 5" x 1-1/4" Rigid Caster | Thermo Plastic Rubber Wheel | 315 lbs Capacity | Plate Size: 3-1/8" x 4-1/8"